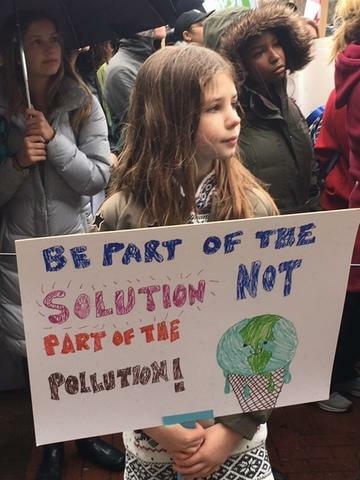 Ann Arbor student at World Climate Strike, to demand faster action to address the rapidly warming climate on Earth due to carbon dioxide emissions from human activity. Vear says elected officials are also not taking the threat seriously enough. "The people in power who are of older generations do not understand the urgency," she says. "And just the feeling that comes with facing this as the youth do." After the rally, some of the students occupied the Regents' building, in part to protest the university's expansion of its natural gas plant. They say other universities have pledged to reduce their carbon footprint to zero by 2050, and the University of Michigan should do the same. The University says the natural gas plant is necessary to provide reliable energy for dorms, scientific labs, and the hospital, and that otherwise, it is taking steps to reduce carbon dioxide emissions from university activities. One of the most famous and vocal climate scientists is speaking out, again. Penn State researcher and author Michael Mann was recently asked by Democrats to be a witness at a hearing on climate science. It was held by the House Committee on Science, Space and Technology. Mann called the other three witnesses fringe experts because they were questioning the science behind climate change. Here’s one way to react to a warming planet: get smaller. We know mammals literally shrank, during a massive global warming event 56 million years ago. Imagine an early horse ancestor the size of a cat. Now back then, the earth was 46 degrees hotter on average than it is right now. So researchers wanted to know: do mammals still experience shrinking - a.k.a. dwarfing - during other, less intense periods of warming?